Heinkel Cars, Kabines and Cabin Scooters: The Heinkel Engine "Hall of Shame"
Over 13 years of Heinkel ownership I've accumulated a number of engines; people have given then to me, I've found them in various places, or people have told me about them and I purchased them. There are a surprising number of engines out there in the USA, especially considering that maybe only a few hundred total vehicles (almost all scooters) were “officially” sold here by dealers. One thing almost every engine has had in common was some type of major mechanical fault or abuse. Scooter engines tend the have the least damage; with car engines, each one has a hard luck story. I present to you a “Heinkel Engine Hall of Shame”. These are some of the best surprises I’ve come across working on engines, what I suspect happened to them, and what I’ve done (or will do) to fix them. 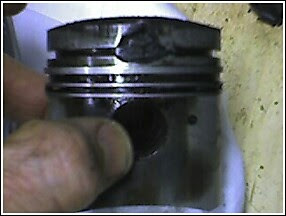 Diagnosis: This is your basic "hole in the piston". The scooter still ran with an obliterated top ring, and no barrel scarring. I guess that’s why they have multiple rings! Fix: Simple (but not cheap): buy a new oversize cylinder, rings, and barrel. Fix: This was easy. Use a proper gasket! That weird yellow green mold was a new one on me but came off easily. Fix: If this was the only cylinder head left in the world you could machine it flat and remove the low spots. I left it as is and put it away. Diagnosis: Ether someone tried to run a bigger plug or this is the result of a botched helicoil insert. Fix: This really could be any old engine case. If it’s outside in a New England winter something will try to nest in it. But this engine case was harboring something else even more surprising that we’ll see in a minute. Diagnosis: An engine builder’s bodge. I could see how this happened, but before doing this kind of work you think they would have asked “maybe I’m doing something wrong?” But no, they went at these pushrods with a grinder. The problem here was that they probably trying to use 175cc engine rocker arms on a 200cc engine, or vice versa. They look the same but are different. his person though they would make it “work” by grinding away at the pushrods. Fix: I'd probably try a metal epoxy and reshape them. I'm filing them away for now. Diagnosis: Snowflake shards of metal and oil that looks like silver nail polish are sure signs of a blown bottom end crankshaft bearing. those snowflakes are busted metal! Fix: Send the crankshaft to the Heinkel Club of Germany (http://www.heinkel-club.de) and get them to rebuild it. The cost is around 300 Euros. I tried to have this fixed in the USA but could not find anyone willing to undertake the task. Diagnosis: Attempting to push start a car that couldn’t possibly go anywhere because the crankshaft was locked up. When you push start a car you are basically attempting to start the car by spinning the tire, which is not how the car was designed. Depending on the gear you use and the age/ mileage of the engine you are putting tremendous strain on internal components. In this case the clutch plates took the first hit, in declining order from the main clutch spring. You can see how the tabs are more progressively worn the closer you get to the outside of the clutch (where the diaphragm spring is located). When I took it apart I found the missing piece at the bottom of the crankcase. Fix: It was serendipity that this piece broke away - I was going to weld it back on, but when I saw the stress cracks throughout the clutch I abandoned that idea. I’ll store this with the abused cylinder head and fix it only if I’m desperate. Diagnosis: Stupidity on my part! I can give you the diagnosis because I’m the one that caused the problem by overreving an engine into a freewheeling state on my test rig. According to my machinist, in an overrev situation the valves usually collide with the piston and trash the top end. In my case the rod bent. I also toasted the bottom bearing. At first glance nothing looks amiss, until you realize that the connecting rod is supposed to be straight! This connecting rod bent in two dimensions. Fix: There’s no economically viable fix. Thank goodness for parts engines! I’m going to use a spare crank. It came from the inside! Which was also a convenient second entrance for the mice. Fix: None. just a mystery solved. I've been using the engine to mock up the alignment of the new floor I put in my second car. Well that's enough problems for a lifetime? Do you have any Hall of Shame Candidates? If you do please send them over and I'll post them.